As the ruling showed, it would be impossible for the Swindle to have broken Ofcom’s accuracy guidelines, because, while news programmes must be accurate, “there is no such requirement for other types of programming, including factual programmes of this type.” The regulator would have reached the same conclusion had the programme announced that the moon was made of blue cheese. Anyway, here was my take on it, which was published by ABC News Opinion last year – around the time it was screened in Australia by the ABC TV. Incidentally, the studio analysis that was screened afterwards was well worth seeing (YouTube link) both for the flaying done by Tony Jones in a post-screening interview with Martin Durkin, and for the gobsmackingly wierd hijaking of the Q&A session by a gaggle of LaRouchites! The Great Global Warming Swindle‘documentary’ purports to prove that the warming we have experienced over the last century is, in fact, unrelated to the more than 300 billion tonnes of heat-trapping carbon dioxide (CO2) and other greenhouse gases that we have released into the atmosphere since the furnaces of the industrial revolution were first lit. Instead, producer Martin Durkin points the finger squarely at natural changes in the sun. On the face of it, GGWS appears convincing enough. It follows the style of many well-respected documentaries, with a faceless (and, by implication, objective) narrator, a cadre of well-credentialed experts, and considerable supporting evidence. Yet in reality, GGWS is a deeply deceptive and propagandist portrayal of the science of global warming. This is not really surprising, when you consider that Durkin was previously reprimanded by the UK Independent Television Commission for using selective editing to misrepresent and distort the views of interviewees in his earlier anti-environmentalist documentary, Against Nature. Indeed, the running time of the 72-minute original, screened in the UK in March this year, has since been pruned by Durkin to 52 minutes. Deletions include the blatant out-of-context quotes of Carl Wunsch (he threatened legal action after the UK screening), a removal of a slew of false statements (such as that volcanoes release far more CO2 than humans, when volcanoes actually release about 50 times less), and a number of distorted graphics, such as a manipulation of 20th century temperature rise. Alas, many others remain. Amongst the selected contrarian ‘experts’ Durkin has rallied to his cause, there are Tim Ball and Patrick Michaels (who also happen to deny that CFCs cause damage to the ozone layer), and Fred Singer and Richard Lindzen (who, in earlier incarnations, had been active denialists of the link between passive smoking and lung cancer, despite neither having any medical expertise). Investigative journalism has revealed that many of the interviewees who appear have received “research funds”, in various guises, from the fossil fuel industry. Most are retired and have not published a scientific paper in years. Many have not published on climate change at all. The GGWS program is riddled with errors and distortions, including howlers from ‘climate scientist’ Tim Ball who says the atmospheric content of CO2 is 0.054 per cent (it is 0.038 per cent – someone who purports to understand the atmosphere should get this basic fact right!) and Fred Singer misattributing a statement made by environmentalist James Lovelock to the UK Chief Scientist, Sir David King. Durkin never states that the mythical charts, which apparently show a medieval warm period and Holocene climatic optimum that were warmer than the present day, come from doctored diagrams produced by a German school teacher, EG Beck. Moreover, the substantial planetary warming of the last three decades (inconvenient to the filmmaker’s message) was mysteriously lopped off the end of this chart! This list of inaccuracies and misrepresentations goes on (and on), and has been detailed by numerous scientific and media outlets. Most strikingly, it is not mentioned in the GGWS that total solar irradiance – the factor claimed to be responsible for global warming – has actually weakened over the last 30 years, and that many of the historical correlations presented have been shown to fabricated. This decline in the sun’s output has occurred at the same time as an unprecedented spike in global temperature (which again, is not plotted). In fact, essentially all the ‘contradictory science’ Durkin presents, such as that the upper atmosphere is not warming, has been debunked by later research. John Christy, the scientist and interviewee on whose work this latter claim is based, seems to have forgotten that he had written in a US Climate Change Science Program report: “This significant discrepancy [between lower and upper atmosphere warming] no longer exists because errors in the satellite and radiosonde [weather balloon instrument] data have been identified and corrected. New data sets have also been developed that do not show such discrepancies“. The Intergovernmental Panel on Climate Change lead author, Stephen Schneider of Stanford University, has previously rebuked the arguments of political scientist Bjorn Lomborg, contained in his book, The Skeptical Environmentalist, for ‘selective inattention to inconvenient literature and overemphasis of work that supports his lopsided views’. This is indeed an apt description of the GGWS. It is remarkable that for each apparent ‘inconsistency’ presented in the program, the well-known alternative (and evidence-based) scientific explanation is never offered. For instance, the cooling from the mid-1940s to the late 1970s in the northern hemisphere is attributable mostly to global dimming (primarily sulphur pollution from post-war industry, prior to implementation of clean air acts). The 800-year lag between the beginnings of temperature increase and CO2 rise in the polar ice record is because the initial warming that provoked the end of the ice ages was caused by changes in the Earth’s alignment and orbit around the sun; not anthropogenic CO2. But it was an eventual increase in CO2, subsequently released by the oceans and biosphere as a feedback after they had begun to warm, that caused much more substantial global heating, and an eventual sea level rise of 120 metres. Let me conclude by emphasising that the ‘expert views’ presented in the GGWS in reality represent the opinion of far fewer than 1 per cent of researchers engaged worldwide into research on the causes and consequences of global warming. It is therefore staggering that such minority views are given such air time by the ABC, and moreover, that they are trumped with such gusto by special interest groups (such as the “Lavoisier group“, who were represented on the follow-up panel of debaters) as providing ‘the answer to the lies and conspiracy’. One must wonder, what’s next on the ABC’s agenda? Perhaps it is a documentary on the reality of a 6000-year-old flat Earth, orbited by the sun and other planets, and resting on the shell of a giant turtle? According to “The Great Global Warming Swindle”, produced by Martin Durkin and broadcast on the UK Channel 4, human-triggered climate change is merely a conspiracy theory, designed by over 2000 climate scientists, the world’s leading climate research organizations and the Intergovernmental Panel for Climate Change to prevent the world’s poor nations from developing. Given an overwhelming agreement among climate scientists and biologists about the reality of human-induced climate change, “climate sceptics”—some of whom are known to have received money from fossil fuel companies—have attempted to argue that (1) No global warming is taking place, or (2) If global warming is real it is of natural origins and not the result of human emissions, and may even be beneficial. The film “The Great Global Warming Swindle”, due to be screened on the ABC on the 12 July, is no exception. It presents outdated temperature and solar irradiation plots which do not include changes recorded since the 1980s—omitting the critical evidence for greenhouse-driven climate change. By 2000 mean global temperatures have risen about 0.3oC higher than the maximum of the Medieval Warm Period (1000-1200AD) and highest since 125,000 years ago when temperatures reached 2-3oC above present levels. Temperature rise rates during 1970-2003 have exceeded those of the last glacial termination by an order of magnitude. The triggers for ice age terminations originated with the sun, whereas the current climate change is caused by anthropogenic increase in emissions. The infrared radiative effects of CO2 are a physical fact demonstrated both in nature and in the laboratory, where the doubling of CO2 levels results in an increase of about 3oC in temperature (Climate sensitivity). Rates of CO2 rise during 1970-2003 exceeded those of the last glacial termination by two orders of magnitude. Past interglacial warming were triggered by sharp spikes in solar irradiation associated with the Earth’s position relative to the sun (Milankovic cycles), with consequent feedback release of greenhouse gas (CO2, CH4) from the oceans and the biosphere, resulting in atmospheric infrared radiation effects and in melting of ice sheets, which amplify global warming. By contrast current climate change is caused by the thermal effects of CO2 emissions from burning of some 300 billion tons of fossil fuel since the dawn of the industrial age, with consequent increase of CO2 to 380 parts per million, 36 percent above maximum levels (about 280 parts per million) which pertained over the last one million years (The Pleistocene). Misconception #4 – No perfect concordance occurs between greenhouse gases and temperatures since the down of the industrial age. Terrestrial mean temperature variations are a compound consequence of several factors, principally solar variations and greenhouse gases. Since the beginning of the 20th century to about 1940 temperatures increased by about 0.45oC as a combined effect of an increase in greenhouse emissions and in solar irradiation associated with the 11-year sunspot cycle (Figure 1). A decline in temperature during 1940-1970 of about 0.1oC occurred, despite continuing rise in emissions, due to aerosol reflectance effects and a decline in the sun spot cycle. From the mid-1970th the solar cycle effects and temperature effects were strongly decoupled due to sharp rise in greenhouse gas levels, rising by about 0.6 oC to 2000 (Figure 1). Misconception #5 – Cosmic rays result in increased clouding, consequently periods of low cosmic ray flux cause global warming. The cosmic ray flux and solar irradiance are inversely related, due to deflection of the former during periods of maximum sun spot activity. Water clouds have both cooling effects (due to reflection) and warming effects (due to infrared properties of water). The increased clouding during periods of cosmic ray maxima and sun spot minima may ensue from decreased solar radiation and lesser cloud dispersion. It has not been demonstrated cosmic rays result in cloud nucleation. Cloud formation is affected by several factors, including concentration of aerosols and dust, and are relatively scarce over areas of maximum warming, namely the poles and the deserts. From the mid-1970s temperatures were strongly decoupled from the solar and cosmic ray cycles (Figure 1). Increases in evaporation and concentration of water vapor in the atmosphere are the consequence of, not the trigger for, global warming. The water contents of the atmosphere over desert and polar regions, subject to maximum warming, is low to very low. The residence time of water in the atmosphere is much shorter than that of CO2, which may last between 5 and 200 years. Misconception #7 – Ice sheet melting effects are slow processes lasting many centuries or millennia. Long-term relations between sea level rise and temperatures exceed 4 meters per 1oC. Significant short-term (decades to century-scale) temperature and sea levels fluctuations (several degrees and many meters) during the last ice age (about 110 – 15 thousand years ago) imply great instability of the Greenland and west Antarctic ice sheets. Marked reduction in permanent ice cover by about 17 percent, and rapid collapse dynamics of these ice sheets, were observed over the last 20 years. Sea levels rise rates have doubled between 1860 and 2005 (1860-2000 +1.6 mm/year; 1910-1997 +2.3 mm/year; 1994-2005 +2.8 to 3.4 mm/year). According to the World Conservation Union, present extinction rates are 50 to 500 times the natural background rate and up to 52 percent of species are threatened with extinction (http://www.iucn.org/themes/ssc/index.htm). Great mass extinction of species during geological history (late Devonian, Permian-Triassic, end-Triassic, Cretaceous-Tertiary, Paleocene-Eocene) have been triggered by volcanic, asteroid impact and greenhouse events associated with sharp increases in atmospheric levels of CO2 and CH4. The disinformation and obfuscation inflicted by vested interests and their mouthpieces have already cost the world at least ten years delay in advancing effective countermeasures to climate change. Those who watch “The Great Global Warming Swindle” need to bear these points in mind. Bamber et al., 2007. Rapid response of modern day ice sheets to external forcing. Earth. Planet. Sci. Lett., 257, 1-13. Crutzen, P.J., 2006. Albedo enhancement by stratospheric sulphur injections: A contribution to resolve a policy dilemma? Climate Change 77, 211-220; Glikson, A.Y., 2007. Homo sapiens on thin ice. The Australian Geologist, March 2007. Glikson, A.Y., submitted, Milestones in the evolution of the atmosphere; Glikson, A.Y., Submitted, Sea Change. Hansen, J., Sato, M., Kharecha, P., Lea, D.W., Siddall, M., 2007. Climate change and trace gases. Phil. Trans. R. Soc. A365, 1925–1954. Hansen, J.E., 2007. Dangerous Human-Made Interference with Climate. Testimony to Select Committee on Energy Independence and Global Warming, United States House of Representatives. Pittock, B., 2007. Ten Reasons Why Climate Change May be more Severe than Projected (in press). Rahmstorf, S., Cazenave, A., Church, J.A., c Hansen, J.E., Keeling, R.F., Parker, D.E., Somerville, C. J., Recent Climate Observations Compared to Projections. Science Express, http://www.sciencexpress.org / 1 February 2007 / Page 1 / 10.1126/ science. 1136843. Rahmstorf, 2007. Climate change fact sheet. Potsdam Institute for Climate impact research (www.pik-potsdamde/~stef). Solanki, S.K., 2002, Solar variability and climate change. Astronomy & Geophysics, 43, 5.9-5.13. Wing, S. L., et al., 2005, Transient floral change and rapid global warming at the Palaeocene-Eocene boundary, Science 310, 993-996; Zachos, J. Pagani, M.N., Sloan, L., Thomas, E., Billups, 2001. Trends, rhythms, and aberrations in global climate 65 Ma to present. Science 292, 686-693. Andrew, I found this paper (Jones et al) very illuminating when it first came out just prior to the ABC broadcast. “The Great Global Warming Swindle (GGWS) is a controversial documentary on climate change by British television producer Martin Durkin. This documentary argues against conventional scientific understanding of the degree and cause of recent, observed climate change. The overwhelming view amongst climate scientists is that twentieth century global warming is largely due to an increase in atmospheric greenhouse gases resulting from increased industrialization during the last 100-150 years. Durkin presents an alternative view that recent global warming is neither significant nor due to human activity. The documentary does not attempt to argue the latter view through any critical deconstruction of climate science orthodoxies. Rather, it contends that modern climate scientists are at best seriously misguided in their collective opinion on the nature and causes of global warming, or are at worst guilty of lying to the rest of the community. Publicity for the documentary leans heavily towards the latter, stating that global warming is “the biggest scam of modern times”. In summary the documentary is not scientifically sound and presents a flawed and very misleading interpretation of the science. And yet on the other hand water vapor does not cause warming positive feedback. Denialism has no problem contradicting itself. Prior to 1980 distinctions between temperature rises caused by greenhouse gas and the solar effect were difficult (though not impossible) to distinguish. THERE IS HARDLY ANY NEED FOR FURTHER DEBATE!!! 1. How to adapt to a warmer and wetter world? 2. How to reduce GHG-e emissions? It seems the ‘deny and delay brigade’ just don’t want to engage or constructively contribute to these crucial questions. In Oz, Garnaut’s final report is a step in the right direction. The difficulty (as always) will be the lead up to Copenhagen – it is a global problem requiring global solutions. 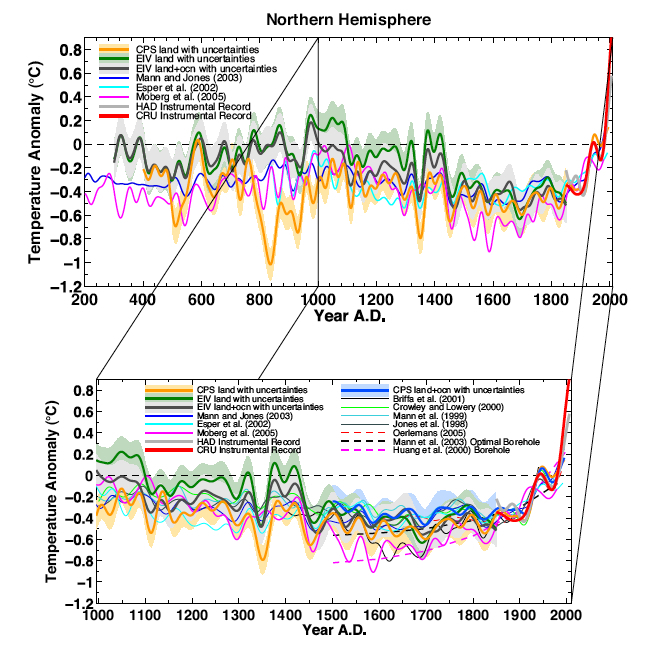 Not only has the Hockey Stick removed the MWP but are you now even denying the holocene maximum? Ohtzi and all the artifacts that are still coming to light? AndrewG, quite frankly that ABC’s loopy, laughably alarmist treatment of Durkin’s doco offered a sneak view into the madness, power, politics, funding and control of the global warming industry. e.g. After the doco, wacko Jones inserted some crazy scientist making an analogy to the small quantity of CO2 in the atmosphere with the Ebola virus. Boy, that certainly was top shelf derangement and only matched by a real fruitloop … David Karoly. He looked off his face with all this CO2 original sin. Cripes, next we’ll hear the naive Al-AGWer bandwagon say that the sun is NOT a star because you cannot see it at night. Wacko Jones had a trip to England and thought it was glib doing a kiddy job on the messenger by getting his ABC propagandists to inserted this disgraceful M Mann’s hockey stick into the Durkin chart. How is that for hypocrisy and deceit from the ABC media priest class? ‘Corse AndrewG, loves this fictional “hockey stick” too. People should be seriously embarrassed with the manner in which our national broadcaster handled this doco because it points to weak people, a weak media and an outcome where science faces a diminishing role in public policy. Let us know when you have something to say. Keiran says: “Wacko Jones had a trip to England and thought it was glib doing a kiddy job”. The Wacko is Durkin and Jones gave him a masters lesson in investigative journalism. Durkin should be grateful. Although I do question the need for 2,000 scientists when it is clear that just one is sufficient to wipe the floor with the pathetic attempts of the lead lined “brains” that deniers dredge up. The Australian Content Standard defines documentary as ‘a program that is a creative treatment of actuality other than a news, current affairs, sports coverage, magazine, infotainment or light entertainment program’. Both Gore and Durkin crafted documentaries or probably to be more accurate polemics – that is ‘texts’ promoting one side of an argument. Why is it appropriate for Gore’s work to be didactic even though it contains a number of inaccuracies and inappropriate for Durkin, regardless of any perceived inaccuracies, to put forward his argument, especially one refuting or attacking specific opinions or doctrines adopted by Gore? Surely Durkin has the right to speak? Or would you rather burn Durkin’s ‘book’? Barry – I’m surprised you’d soil your blog by quoting the trite utterings of Monbiot, especially as he is just one of many to claim that phrase as their own. Regardless of what you believe to be ‘the facts’, Durkin has the absolute right to publish whatever he likes. Refute his assertions as you must, but to opine that the ABC shouldn’t have aired his program because it contains what you believe to be merely “minority views” is unwarranted. Should a similar standard be applied to every ‘publication’? If it doesn’t reflect ‘goodthink’ should it be ‘unpublished’ and its author declared an ‘unperson’? As for the turtles… I understand there are well in excess of 900 million Hindus who are quite fond of the notion the world rests on the back of an elephant which in turn stands on the back of a tortoise etc. Interestingly Hindus have ‘ten commandments’ or rather ‘recommendations’ that are in some ways similar to Christian ‘commandments’. “Thou shalt not deny thy brother his chosen path, but radiate tolerance and follow thine own light quietly”. Not bad really – pity some other popular ‘faiths’ don’t incorporate the sentiment into their doctrine. I suppose the difference between Gore and Durkin’s films is that Gore’s is mostly representative of the conclusions of every relevent scientific society in the world, while Durkin’s is representative of the same gang of contrarians and pseudo-scientific nuts who have kept the “debate” going for the past 30 years. PeterW, regarding Hindus, you are confusing religion and science. I also suggest that one of the reasons you so intensely dislike Monbiot is because he is not averse to saying things that are uncomfortably true, irrespective of who it offends (he’s also one of the rare few journalists who really ‘gets it’ in terms of who serious the issue of global warming is). Durkin has no right to deliberately distort scientific data, and grossly misrepresent people and their ideas to suit his purpose. If you believe he does, then I opine that you are not being rational. There are still many who question the link between climate change and the above. No doubt, if and when the Gulf Stream fails and North Atlantic temperatures plunge (as happened repeatedly during global warming events in the recent history of Earth, due to ice melt flowing into the ocean) — denialists will claim “global cooling”. A. Had one been adviced the plane he is embarking on is found to be have an engine problem –to what length would he go to argue with the engineers and the aviation authorities? Would he assume a conspiracy theory? B. Had one been adviced a cancer has been diagnosed, to what length would he go to argue against the medical doctors, the supervising medical experts, the health profession? Would he assume a conspiracy theory? It would appear the best thing some people can offer in the face of the documented deterioration of the terrestrial climate is the CONTINUING USE OF THE ATMOSPHERE AS OPEN SEWRAGE FOR CARBON GASES. Sorry Barry, but I think I’m with PeterW on this one. It’s at least arguable, and certainly not irrational to contend that free speech includes the right to tell lies. Whether the ABC should have broadcast Durkin’s is a slightly different question, but on the whole I think they handled it pretty well, with the following studio analysis allowing immediate rebuttal. Though yes, once the LaRouchites got into it I found it so cringe-making I literally couldn’t watch it. There could be a difference between free speech of individuals, which should definitely be upheld, and concerted (often-financed) efforts by vested interests to promote the dissemination of toxic substances (the classic example being tobacco smoking). There exists a vast literature about advocates of both smoking and carbon emission. I think it was worth the ABC broadcasting Swindle so they could reasonably put on the Jones interview of Durkin. If you like to watch someone squirm, that was one of the best. “Durkin has the absolute right to publish whatever he likes.” No, he does not. None of us do, if we misrepresent and libel others. Valid views are one thing; dishonest claims are another. I agree that ABC treated TGGWS in the way it deserved (interview and discussion afterwards), but surely you do not mean that “free speech includes the right to tell lies”? What’s the quote? “That way lies madness”? TrueSceptic@23, if you follow the hyperlink I put in, you’ll see that a panel of state Supreme Court judges in the US thought that yes, free speech does include the right to tell lies. As for me, to tell you the truth (;-)), I’m not entirely sure (other than the obvious classic exceptions like falsely shouting ‘fire!’ in a crowded theatre), and remain to be convinced either way. By the way, “everyone is entitled to their own opinion, but they are not entitled to their own facts” apparently originated with Daniel Patrick Moynihan. Re. #24, Mark Duffett, does free speech in your opinion include the right to falsify accounts? Or to falsify tax returns? Fraud is fraud is fraud. 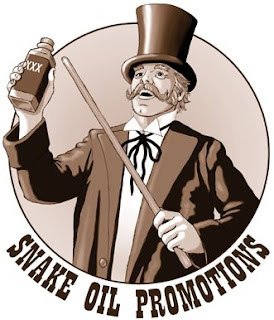 Barry, a link – it sums up my appreciation of Monbiot and his utterings quite well. No merely pointing out that some belief systems are more tolerant of contrarians than others. TrueSceptic, please forward your address so I can have all my ‘texts’ vetted for validity. I don’t want to have to make up my own mind – I might make a mistake and pick up ‘Goldstein’s Book’ because of my cringing ignorance and intellectual inadequacy. Dave @ 25: No. The examples you cite can be simply characterised as theft. The implication being (thinking aloud here) that the right to tell lies depends upon their realised consequences (which may be what Andrew Glikson @ 17 was getting at). But in this case, the consequences are themselves the subject of the debate, so…I think I can see an infinite regression coming up here. Perhaps TruSceptic I was too harsh. After some time in the world I do tire though of being TOLD what is truth and what is not, what is valid and what is not and so on. I’ve watched both of the ‘films’ mentioned in this thread and judge that they are well made polemics with high production values. They both push their particular positions on the causes of climate change and neither allows any divergent points of view except to hold them up to ridicule. They are both ‘op-eds’ and use emotive imagery, suggestive music and carefully constructed narration and intonation to try and persuade their audiences that their argument is unimpeachable. Did Durkin ‘lie’? Did he deliberately ‘speak’ untruthfully with the intention of deceiving or did he tell the ‘truth’ as he believes it to be? Neither Durkin or Gore has escaped with ‘impunity’, both have been publicly ridiculed, their assertions derided and motives mocked. Your comments on this blog are evidence that they have not escaped scrutiny. You obviously believe Durkin’s polemic should be censured and that it did not deserve to be broadcast, but others hold similar passionate views about Gore and his ‘documentary’. Should they prevail or is your ‘truth’ more worthy? Should Durkin’s ‘book’ be burned? Thanks for a considered response but I don’t see AIT and TGGWS being equals at all. AIT was made in good faith by someone who took the trouble to consult experts in the field (and he was once one of Roger Revelle’s students so it didn’t come out of nowhere). AIT is certainly not beyond criticism but it is a popular documentary, not a scientific paper. There are some claims made that are not supportable (but not actually false), and some statements that are open to (mis)interpretation, but on the whole it is OK and up to the standard of most documentaries. TGGWS was made as a polemic by a proven liar with no attempt at presenting the true state of knowledge about climate. It contains many inexcusable falsehoods and misrepresentations, inexcusable because they are not only blatant but easily refuted after trivial research. The slant of its maker is further exposed by the fact that after the more egregious falsehoods were exposed, they weren’t corrected in the programme but simply omitted, shortening it by 12 minutes (IIRC). TGGWS was one of the most outrageously dishonest programmes that I have seen on terrestrial UK TV. Until then, I hadn’t been too concerned about AGW or AGW denial, but this got me involved in various forums, the first being Channel 4’s own Science Forum. Dave Rado did what I only thought about doing and compiled, with expert advice, a comprehensive and meticulous rebuttal of the programme’s many false claims. Rather than repeat them here, I suggest you read http://news.bbc.co.uk/1/hi/sci/tech/7517444.stm and then http://www.ofcomswindlecomplaint.net/ . In particular, read Dave’s piece about freedom of speech.